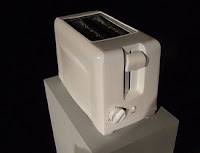 I think what you may have, with your homemade industrial toaster, is a beautiful illustration of the falseness of the entire concept of "economies of scale." It looks to me, at this point, that "economies of scale" only serve to increase "profits"- and they are based deeply on both cheap oil, and labor kept cheap by inappropriate means. Economies of scale are- a sham. Not real. An illusion- and a lie. :-) Sorry if I sound cranky about that. Economies of scale are still touted as a huge advancement for mankind; and desirable at all costs. And it just ain't so. Get out the old toasting fork. Real efficiency!